It was cold and a bit muddy, but it was the most fun we have had at the office all year, okay maybe not exactly “at” the office. JMA closed up shop for a day last week and headed to the International Plowing Match 2012 in Roseville. 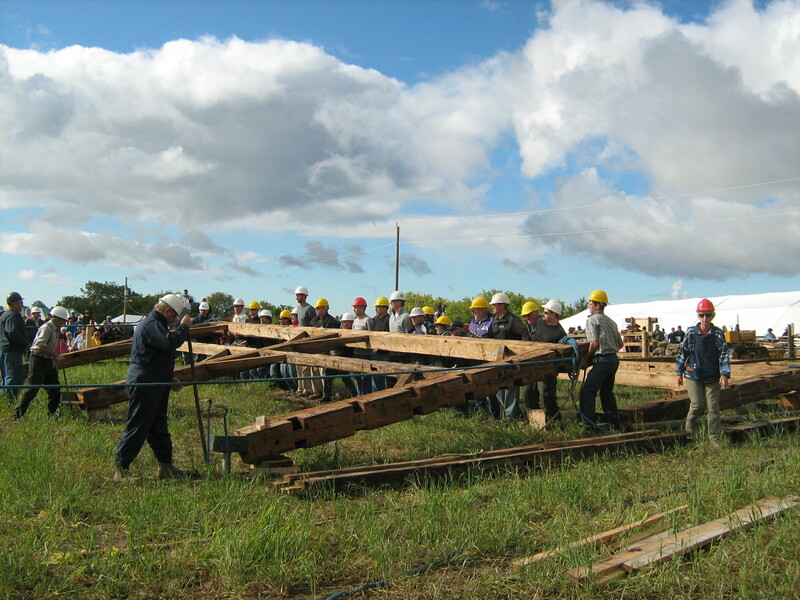 Our team volunteered our time and muscles to assist the Mennonite Disaster Service in a demonstration of an “old fashion” barn raising, which took place over the course of the Plowing Match within the antique section of the event. The barn was brought in from Paris Ontario for the demonstration and was assembled and disassembled at the event before being transported to it’s final resting place at a private residence in Collingwood. Our day started out with a very appropriate tractor ride from the parking area to the event grounds, once we where able to find the barn raising site we grabbed our hardhats and waited for instruction among the other volunteers (about 40 in total). Most of us being first time barn raisers listened carefully as we where explained the process. Come 10am it was show time and people begin to gather in the bleachers to watch our efforts. It started with most of us lifting the first positioned frame by hand as high as our arms would let us, yelling “Yo-He” which means hold on “Yo” and lift on “He” (trust me, you do not what to mix that up). A few people pulled on ropes on the opposite side, guided the frame as the rest of us lifted it. 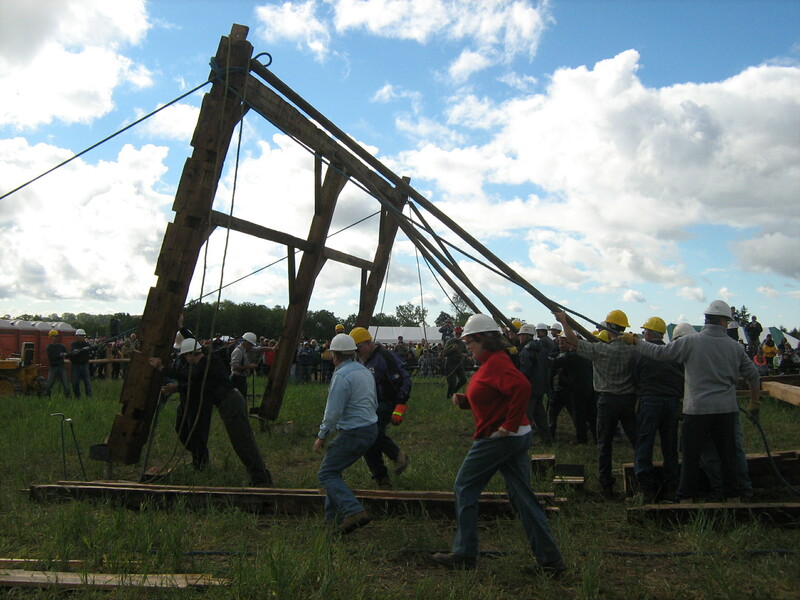 Once our arms couldn’t push the frame any higher assigned people put the pikes (long piece of timber with a spike in one end) in place, butting them up against the frame. Once the pikes where set everyone moved out from holding the frame and helped either on the ropes or on pushing the pikes moving the frame up to its vertical position. 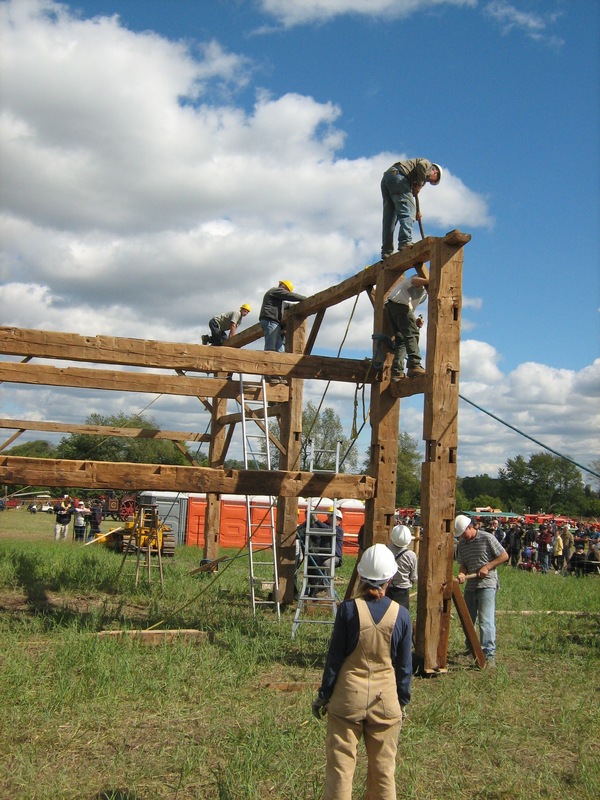 Once the frame was up and resting on the prepared foundations, the ropes where tied off and nails where hammered into the legs of the frame where they met the foundation. 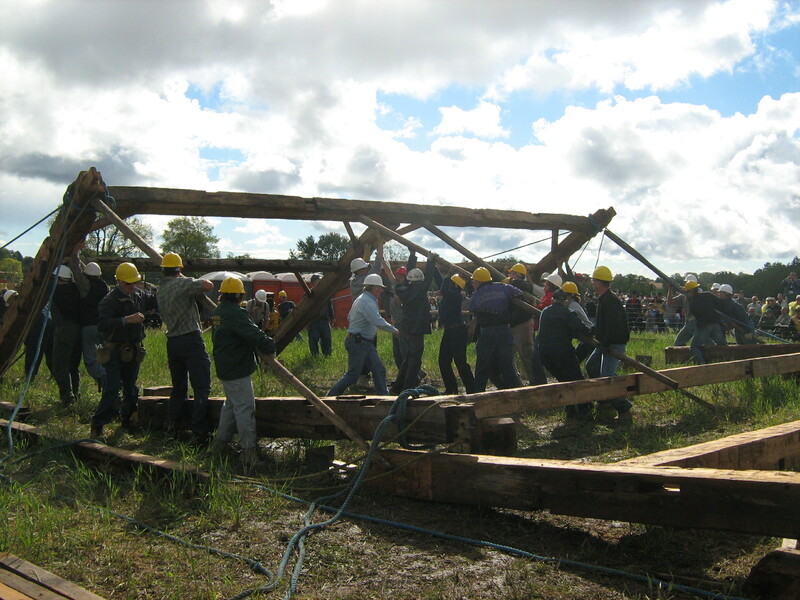 This process was continued for the second and third frames, then support beams where raisin by ropes, these beams secured the frames together and where fixed in place with pegs and braces. Over the course of the day we rose 3 frames including their supports, but our work stopped there, since this demonstration was to be completed over the week, we had to leave the rest of other volunteers to complete in the days to come. 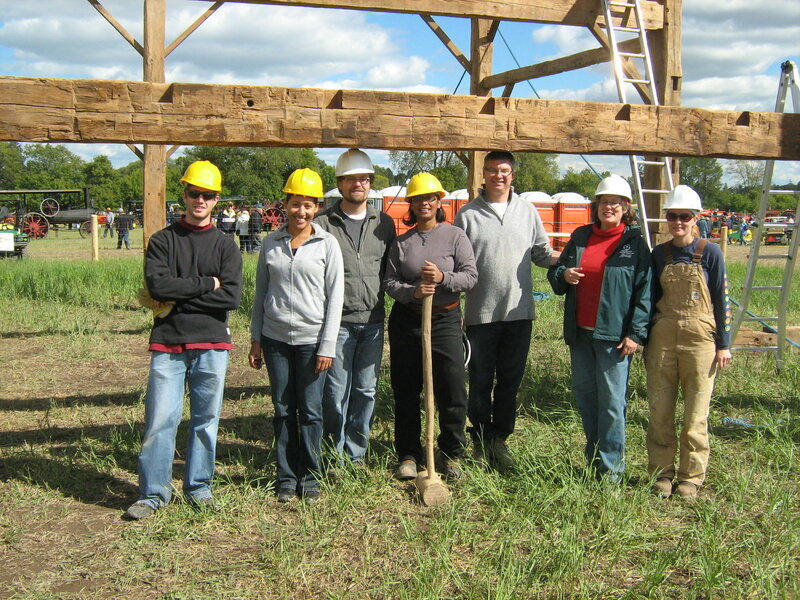 JMA had a great day learning the traditional way to raise a barn. I only wish we could have been there the rest of the week to help finished what we started. 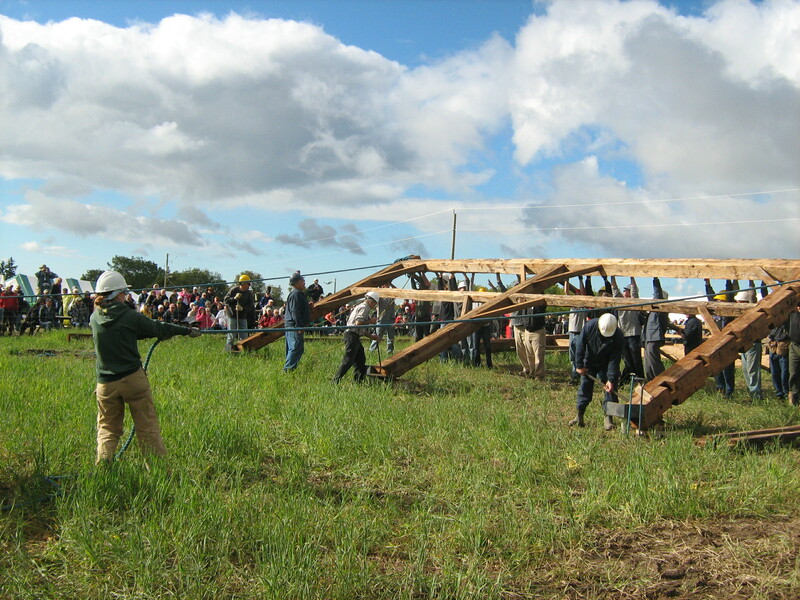 This entry was posted in Community, Rural Design, Uncategorized and tagged barn, barn raising, International Plowing Match, Mennonite Disaster Service, teamwork, yo-he on 2012/09/27 by adminjma.